Kurt Michaelson: How much do you treasure God's Word? How much do you treasure God's Word? David Seymour. 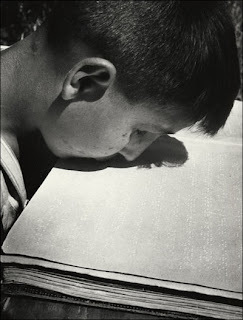 “Blind Boy Reading With His Lips”. 1948. Corcoran Gallery of Art, Washington, D.C.
﻿"﻿﻿Back in the gospel of Mark, if you will. I was reading this week in kind of a random fashion and I came across an interesting little account. In France, some years ago, there lived a poor blind girl and she had obtained, according to the writer, a gospel of Mark in Braille and it was all she had. She read it with the tips of her fingers and she read it and read it and read it until her fingers became callous and her sense of touch diminished so that she could no longer distinguish the characters. "To her surprise, her lips more delegate than her fingers discerned the form of the letters. All night she perused with her lips the book of Mark and overflowed with joy at this new acquisition. "I don’t know how precious the book of Mark is to you, but I hope it’s precious, it is to me. And the more I go through this book, the more hours I spend in this book, the more precious it has become to me."